The Edel line of sailboats was designed and produced in France, and they were also built under license in Canada. The 540 tends to compete with the Sandpiper 565, and it is a step up from those small sailboats that come with a minimalist cuddy cabin. In fact, they claim that the Edel 540's cabin has room to sleep 4 people, but this is probably more of an indication that there is sufficient room to sleep two adults in reasonable comfort. For its size, this 18 footer has a very wide beam (8 feet, or 2.44m). While the Edel 540 has a fix keel with 331 pounds of ballast, the wide beam provides for a lot of stability. It's a nice looking boat and it tends to appeal to people who want a pocket cruiser that truly looks like a little yacht. 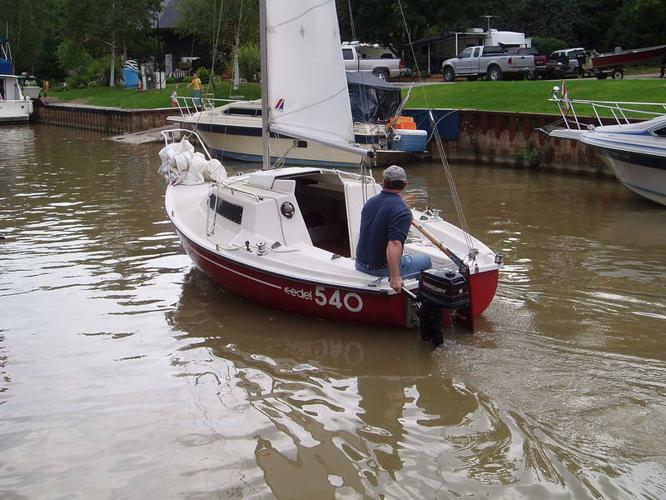 The Edel 540 has a fixed keel, with draft of only 2' 4" (0.70 m) it is very easy to trailer this boat. The trailer has a 10? telescopic tongue extension for ramp launching/recovering. Hauls extremely well on the trailer. Sails: Main, Standard Gib, 175% Genoa, and Storm Gib. Rigged for single handed sailing. Includes whisker pole for light air.